Isodiol International Inc (CSE: ISOL) by all accounts had an excellent trading day on Monday. The company formerly known as Laguna Blends Inc. saw gains of close to 20%. For long term investors, this was welcome news. After seeing its peers in the industry post consistent gains this last week, investors were undoubtedly wondering when it would be their time to shine. As a result of this success, lets take a quick look at five things you need to know about Isodiol International. 1. Prior to Isodiol International, it was known as Laguna Blends inc.
Isodiol International February 17th, 2017 news release. On April 28th, 2017, Laguna Blends signed an agreement to purchase ownership of Isodiol. In its entirety, the purchase amounted to approximately $10.5 million being distributed to the owners over the course of 12 months. The deal involved both cash and the issuance of common shares in lieu of cash. Later, on June 6th, a motion was passed for the company to change its name from Laguna Blends to that of Isodiol International. 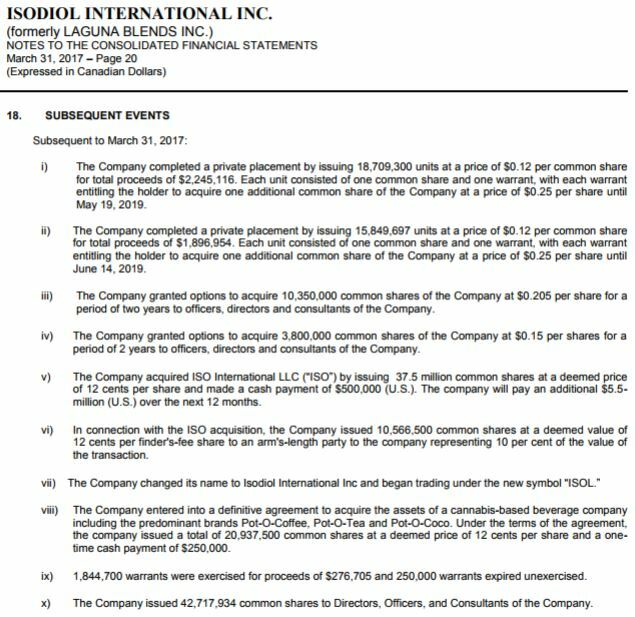 Isodiol International 2017 audited financial statements subsequent events. In all reality, this is nothing new for the organization. For the fiscal year ended March 31st, 2017, it took three pages of the audited financial statements to acknowledge all the shares issued. This is a company that LOVES to dilute the value of its stock. This is bad news for shareholders, who have consistently seen the value of their shares plummet. With any luck, this trend will die with the name of Laguna Blends. All is not bad for Isodiol International. Since the acquisition that was performed by Laguna Blends, it appears the company is in turn around mode. Revenues are up significantly as a result of Isodiol’s involvement in the company. In fact, for the quarter ending June 30th, 2017, they had a gross profit of $1,607,004. They were still cash flow negative during this term however. The latest financials for the company are eagerly awaited. The last financials issued by the company did not have a full quarter with Isodiol’s revenue’s included as a result of the timing of the acquisition. We’re interested in seeing the true benefit the company provides to the balance sheet. It could signify a major turning point for the organization. Isodiol International’s August 4th, 2017 corporate update. As can be seen above, a handful of corporate updates have been issued. These typically include revenue figures for the previous month. From this, it can be estimated approximately where the quarter will end. Curiously, no updates were provided for the months of August or September. In any case, the quarterly financials as previously stated are due at the end of November. From this we will be able to better analyze the financials of Isodiol International. True to its name, Isodiol is an international organization. Aside from Canada, it has operations currently in place across the America’s. This includes in Mexico, which on June 19th, 2017 legalized medical cannabis. Two days later, an announcement was issued that the company had set up operations in the country, and would begin shipments of CBD products promptly. In addition to this, on July 6th, 2017, Brazil gave their product Isoderm the green light for treatment of Parkinson disease as well as epilepsy. Isodiol International’s August 30th, 2017 news release detailing its distribution agreement with FarmaUSA. As a result of this success in international markets, Isodiol signed a distribution agreement with FarmaUSA. This agreement would enable the company to further enhance its distribution lines in South America. Furthermore, it assists them in diversifying their organization so that they are not reliant on a single market or product line for their success. Lastly, on October 4th, 2017 it was announced that Isoderm had also been approved for the Chilean market, further strengthening their position in South America. On May 30th, 2017 Isodiol International, while still under the Laguna Blends brand, issued a news release indicating they had signed a binding letter of intent. This letter of intent was to purchase the Pot-O-Coffee brand, which had a final price tag of $2,848,500. This brand consists of single serve coffee, tea, and cocoa that has been infused with cannabis. This includes both CBD and THC variants. Further to this, a strategic update was provided on November 1st regarding the brand. This was likely a result of the agreement between Canopy Growth Corp, a market leader, and Constellation Brands, a goliath in the beer, wine, and spirits industry. Within this strategic update, it instructed that a distribution agreements had been established in several US states for Pot-O-Coffee. More importantly however, it indicated an acquisition occurred for Culinary Coffee Roasters, LLC. Isodiol International’s November 1st, 2017 news release detailing the acquisition of Culinary Coffee Roasters, LLC. Why is this significant? The deal made between Canopy Growth and Constellation Brands indicates where the major players in the market believe the industry is headed. 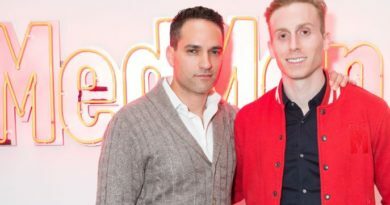 Due to the current level of experience between these two companies, it is likely that cannabis infused beverages are in the semi-near future. With this current acquisition, it gives Isodiol International a solid footing in the market related to coffee infused with cannabis. This is a result of the knowledge gained with this acquisition. Every company has positive and negative aspects. Whether this be price-to-earnings ratios that are through the roof on a stock, or a poor history before a significant acquisition or change in management. As investors, we need to be able to sift through all the information related to a stock. More importantly, we need to understand the significance of each piece of information, and how it relates to the larger picture. This is key for proper stock analysis, especially when your focused on the junior stock exchanges. There is inherently more risk associated with investing in these less established businesses. Just be sure to remember the age old cliche – Rome wasn’t built in a day. That being said, be sure to keep your head in reality. News releases are crafted to help sell investors on buying company stock. Process the information, and then determine if its a realistic expectation or projection for the company to have. Common sense goes a long way when it comes to investing. Most importantly of all, always remember: Dive deep. ← BRIEF: Mezzi Holdings – From Handbags to Blockchain?